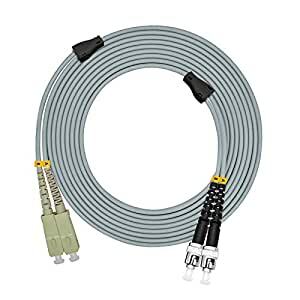 100 Meters (328 feet), Armoured, LSZH, Zip-Cord Reinforced, Duplex (2 Fiber Strands), 1.25mm ceramic ferrule, SC/PC to ST/PC, Fiber Patch Cable/Jumper Cord. Great flexibility and duribility with a flexible stainless steel tube inside the outer jacket as the armor to protect the fiber glass inside. It retains all the features of standard patch cord, but is much stronger. It will not get damaged even if stepped by an adult and they are rodent-resistant. Low Insertion Loss, Low Back Reflection,High Return Loss, All our products are 100% new fiber optic cable of carrier-class quality ,and 100% test before delivery.